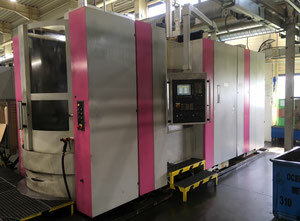 Horizontal machining centers for sale are the main cornerstone subcategory in Exapro online catalog of used machinery. 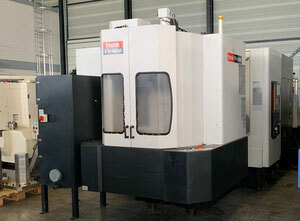 Horizontal MC are positioned under Metal - machine tools category together with vertical machining centers and machining centers 5 axis. 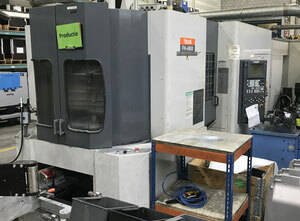 Machining centers can perform various operations, such as milling or drilling, and are commonly used to manufacture spare parts of precise shapes and sizes. Now we have a general idea of the horizontal MC features. 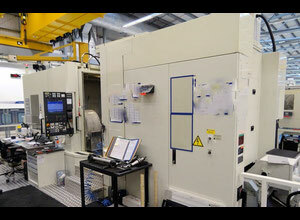 But what is actually happening inside of the machining center when it goes down to production process? This is no longer a mystery. 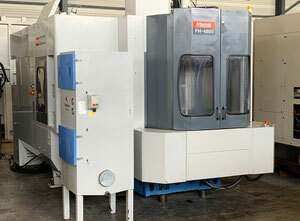 Machining centers are very complex machines that combine features of various types of industrial equipment at once. In a vertical machining center, the spindle is moving on a vertical axis, while horizontal machining center is equipped with a horizontally moving spindle. What is common for both types of machining centers, there is a built-in rotary table that allows milling at different angles. The workpiece is positioned on a rotary table and the spindle is moving horizontally to shape and form the final part. If both the table and the spindle are moving in different directions, that would make a 5 axis machining center. 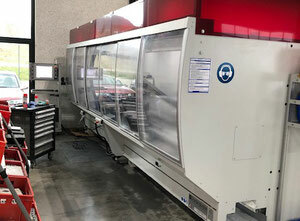 New or used horizontal machining center? Is it best to purchase used HMC or a piece of new equipment? Second hand horizontal machining center has an undeniable benefit compared to the new model: its price is more competitive and buying a used machining center has proved to be a good way of cutting down the costs. 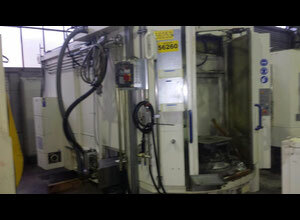 On Exapro, we have dozens of used horizontal machining centers offered on a daily basis. All you need to do is go through the list of products and select the ones matching your search criteria. It could be the price, manufacturer or year of production that would help you determine the model for future purchase. 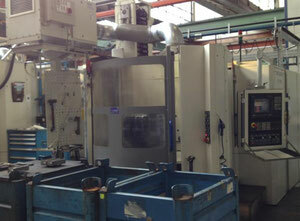 Used horizontal machining center is most probably going to be equipped with a CNC feature. What is CNC? It stands for computer numerical control and is a widely used technology granted by the fast evolving technical world. Automatically controlled machining centers (vertical or horizontal) have a much higher degree of freedom that permits to use these machines for work of the highest precision (e.g. engraving). 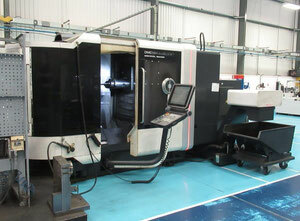 CNC feature allows to automatically change the tools which is a big breakthrough as opposed to manual tool change. This ensures smooth work flow and minimum time required for transition from one operation to another. Numerical control also significantly increases manufacturing precision without having any impact on speed and operating cost. Horizontal machining centers are used to perform all kinds of high precision work on metal parts. In a horizontal MC the horizontally mounted workpiece is also rotated, adding the fourth axis (C axis) to the three usual axes (X, Y, Z). The rotation of workpiece can be asymmetric and eccentric. There is also a possibility of the fifth axis (B axis) which controls the tilt of the working tool itself. Taking advantage of the 5 axis conjunction allows to produce extremely complicated shapes: complex geometrical forms and even organic forms such as a human head. 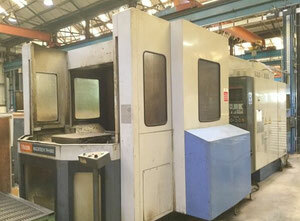 CNC horizontal machining centers deals with such complex tasks with ease. The list of main manufacturers for horizontal machining centers looks fairly familiar. No surprise, since the same names of big metalworking players are listed for the category of vertical machining centers. 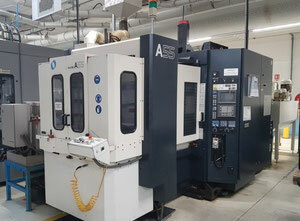 In the HMC category you will find offers for the world's best manufacturers: used horizontal machining center by Deckel Maho, machining centers by Okuma or Mazak horizontal machining centers.